The Hammersmith Gazette is reporting that H&F Council has failed the recent Audit Commission inspection of how it manages its council homes. If this is confirmed it will disqualify the Council from receiving much of the £114 million of the original £192 million Decent Homes investment programme that had been set to transform Council housing across the borough – making this the biggest debacle faced by H&F Council in a generation. The Government requires the Council to prove that it is running a housing service that is, at least, satisfactory before allowing it to invest such large amounts of public money. The Gazette is reporting that the Audit Commission has graded H&F Council’s housing management as “poor” with “uncertain prospects for improvement”. I understand that H&F Council is contesting this judgement and for the sake of the thousands of local people that would be affected by this, I hope they are successful. Housing management has been cloaked in secrecy since the Conservatives took office two years ago with the scale of their failure only now becoming clear. H&F Council’s housing service was viewed as one of the best in the UK only a few years back. It passed the last two Audit Commission inspections under the last Labour Administration - which had secured the multi-million Decent Homes investment programme in 2004. Cllr. Lisa Nandy, Labour’s Shadow Lead on Housing and Regeneration, has confirmed that the Opposition will do everything it can to help the appeal. She commented “Some of our residents are now facing a situation where they are stuck in appalling housing conditions, while their neighbours enjoy a decent standard of living. The Opposition will commit our assistance to the Tory Council to help them to appeal their "poor" rating, and win back the money Labour secured to give people decent homes. We urge them to put party politics aside and accept our offer of help, which is based on years of running a well rated housing service”. a) on our estate the works for Decent Homes due to have started in Nov 07 have just started. b) information from the project manager requested in the residents meeting & since is outstanding with emails reaching a wall of silence. Also it is worth noting. One of the main issues raised by residents on my estate was the size of the kitchen cupboards. Too small not enough depth. So many will be installed because residents want their entire kitchens done. But will be ripped out and replaced once the work is complete. How much of the budget is going to be wasted on just this one issue? I have started a blog to keep those on my estate up to date. Not only are we living in appalling conditions, we have to face the lbh&f blunders with rent and their rude attitudes to tenants when they are trying to put right the blunders. The crime rate in the area is rising at an alarming rate, it's not safe to walk out of your home in daylight let alone at night. 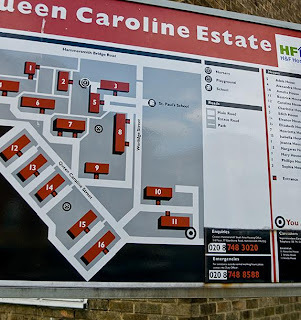 Having lived on the queen caroline estate for the almost a decade, I have witnessed the deteriation of the place during that time. The community police and council spend more time harrassing residents than keeping the bad elements who do not live on the estate out. Stabbings, muggings, drug deals done in broad daylight in full view are walked past by the community police. Why aren't there working cctv cameras covering the areas behind the main blocks on queen caroline street between worlidge street and the river. The bungalows & surrounding areas are a haven for drug dealers, users, etc. I have personally witnessed syringes, even bags of drugs left on the floor for anyone to find. Not to mention firearms found in hedges in the very same area. It's about time the powers that be pull their heads out of the sand and instead of exposing their rear ends, actually get them moving to do something constructive. We pay tax, we work hard, we have the right to live in a decent & safe environment. Any of the powers that be who think that us poor council dwellers are making a fuss out of nothing can swap homes with us, come and live here for 6 months and I guarantee you'll sing a different song.